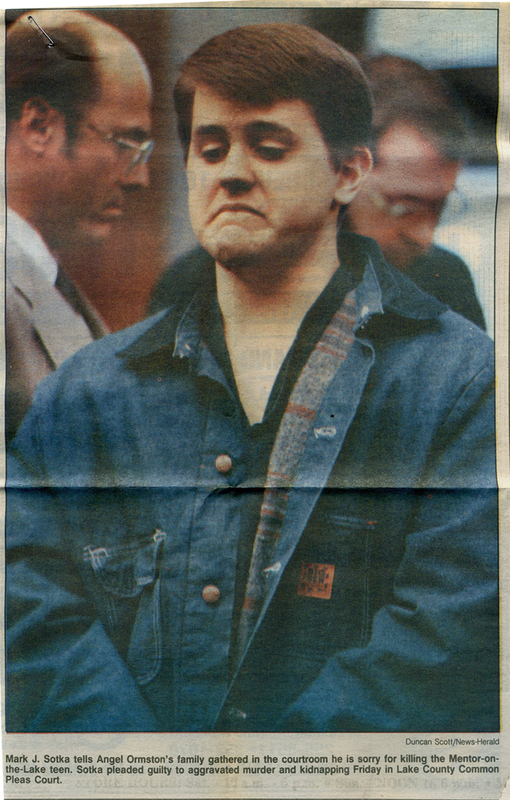 David Gelhausen was just days before his second birthday when his 12-year-old aunt, Rebecca Sue Gelhausen, was kidnapped from Painesville and then raped and murdered. 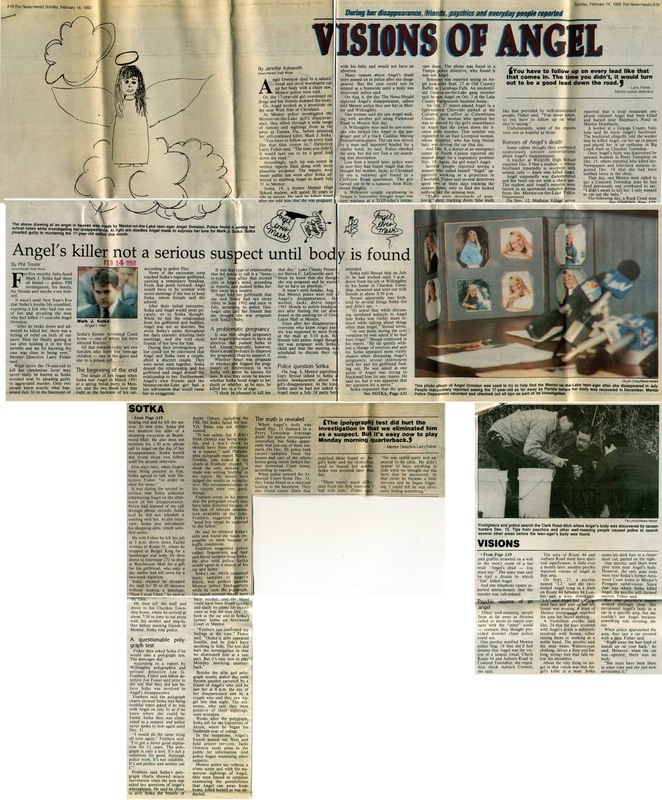 The victim’s body was discovered Feb. 17, 1974, in a wooded Perry Township area. The horrific crime continues to haunt Rebecca’s remaining family members 40 years later. 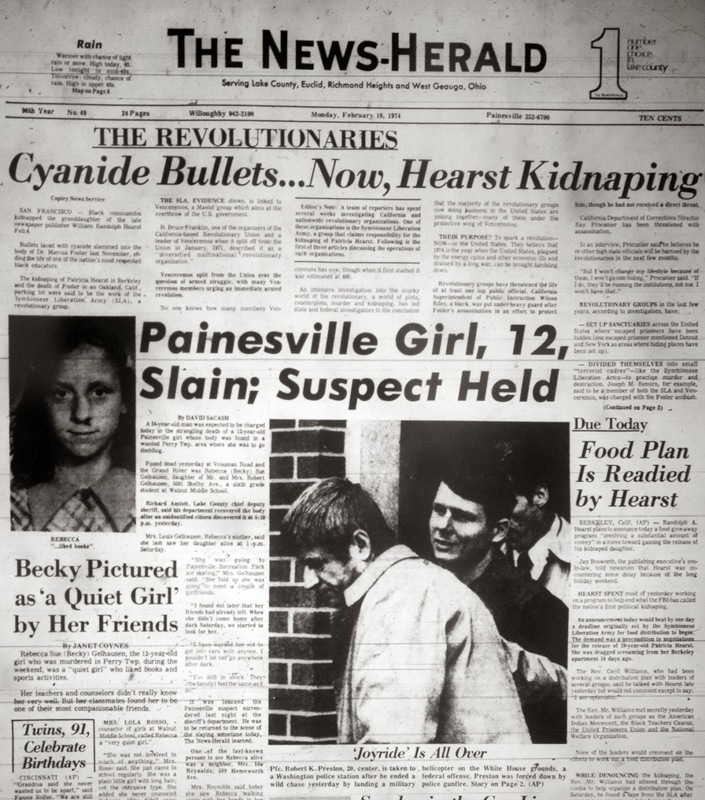 The News-Herald reported the news of the slaying in the February 18, 1974 edition and that of the suspect being charged the following day. Reporter Tracey Read shares the continued efforts of family and friends to keep her killer behind bars. A year ago today, missing women Amanda Berry, Gina DeJesus and Michelle Knight were found alive on Seymour Avenue in Cleveland, having been held captive for 10 years. 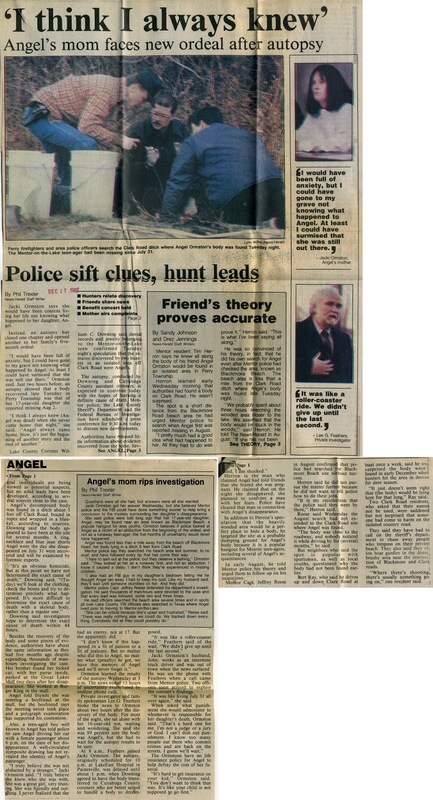 Below is a compilation of tweets, articles, photos, videos and more that were published as the news unfolded — including reaction from residents who had followed the case. 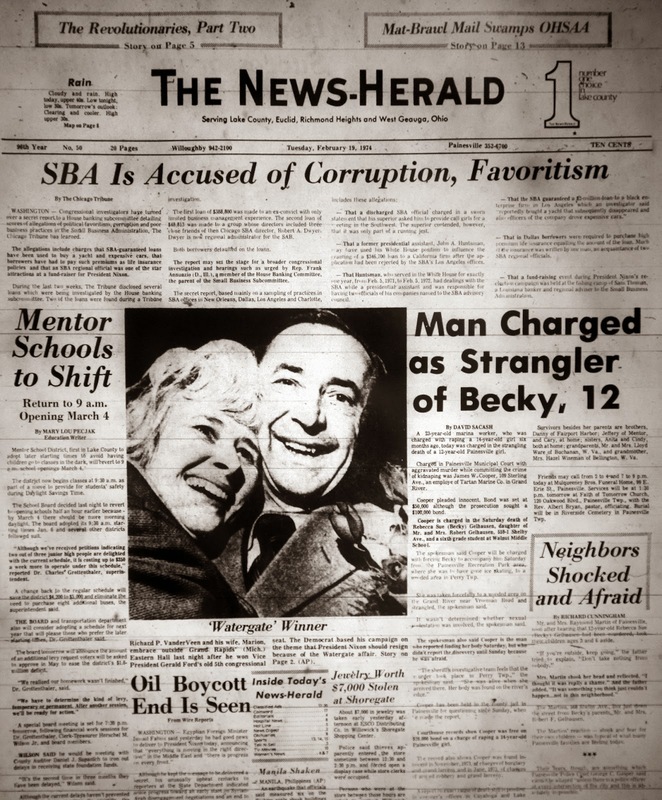 Just a few weeks after the governor declared a state of emergency in Lake County in January 1978, things really got bad. 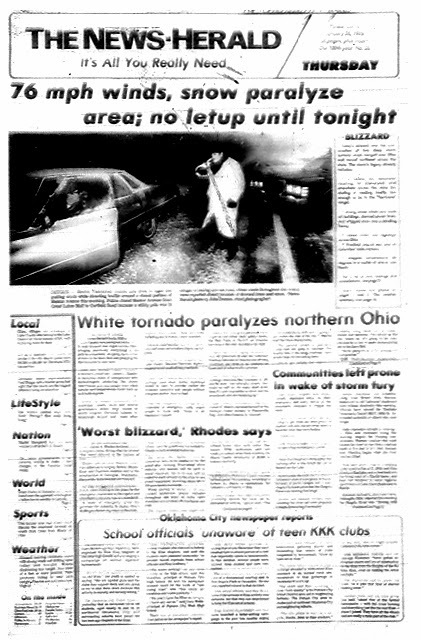 The blizzard of '78 pounded the area Jan. 26-27. A wind gust as high as 82 mph was recorded at Cleveland Hopkins International Airport. Tragically, 51 people died in Ohio as a result of the storm. So perhaps we should count ourselves lucky that this week's blast of arctic weather didn't prove as deadly. This week's frigid temps and blustering snows have all of us shivering more than usual. And almost without exception chatter around town has been about which communities got socked with the most snow, which roads were the slickest and which events had been canceled due to weather. In other words a typical January in Lake and Geauga counties. 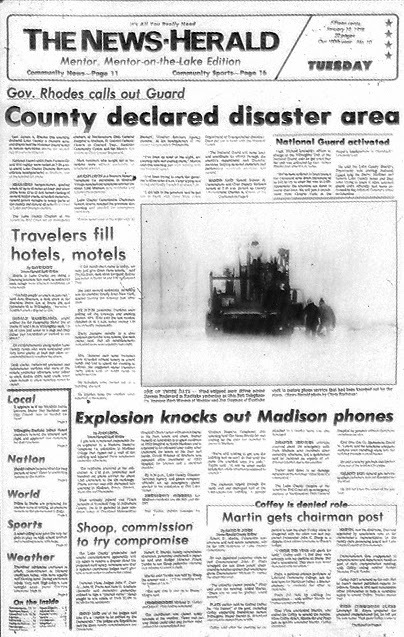 How many of you remember early January 1978 when the National Guard was called in? Little did we know this was just a taste of what that January had in store for us. 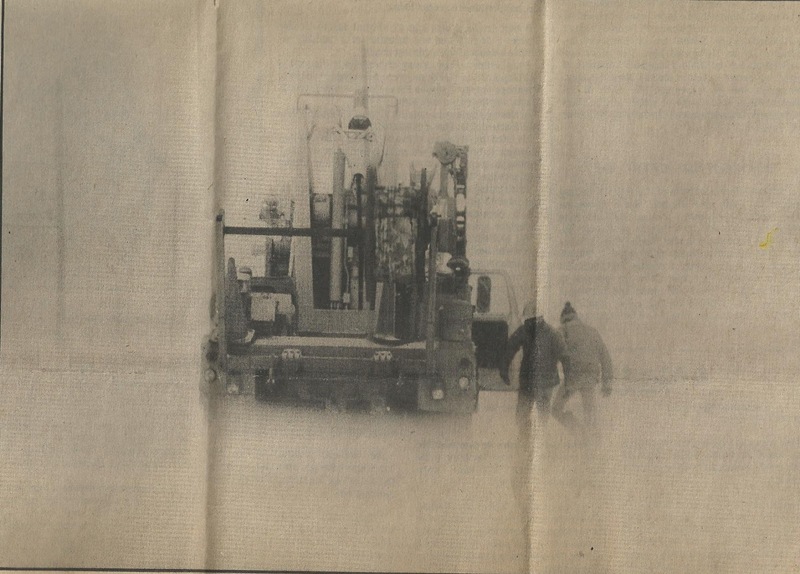 Next week we'll look back at coverage of the Great Blizzard of 1978. Gov. James A. Rhodes this morning declared Lake County a disaster area and dispatched the National Guard to aid in rescue operations during the second day of a severe blizzard. National Guard units from Painesville and Willoughby were called at 7:30 a.m. to assist Lake County Disaster Services officials headquartered in Madison, one of the hardest hit areas. Near-zero temperatures, gusting winds of up to 40 miles an hour and snow drifts from 12 to 15 feet forced closing of several major roads, stranded motorists, caused power outages in many parts of the county and forced all schools to close in Lake and Geauga counties. The Lake County Chapter of the American Red Cross set up emergency shelters at Northeastern Ohio General Hospital in Madison, St. Gabriel Catholic Church in Concord Twp., Eastlake Community Center and the Mentor fire station on Civic Center Boulevard. Most residents who sought aid at the centers were without electricity or telephone service. An explosion at a Western Reserve Telephone Co. substation in Madison Village knocked out telephone service for about 7,500 Madison area residents and injured three persons. Lake County Commission Chairman Robert Martin reached the governor this morning and pleaded for emergency assistance. Martin spent most of the night with Al Stewart, Disaster Services Agency director, at his headquarters at the county fairgrounds in Painesville. "I've been up most of the night, answering calls and making more," Martin said this morning just after talking with the National Guard. "I've been trying to reach the governor's office since 6 a.m. I kept trying and trying and finally I made it at about 7:30. "I did talk to the governor and he put me in touch with Dave Weir (Ohio Department of Transportation director). Dave put me in touch with the National Guard. "The National Guard will come here and coordinate its efforts through the sheriff's department and Disaster Services, helping stranded motorists and performing whatever services are needed." Martin said Sheriff Edwin H. Cunningham and Chief Deputy Richard Amiott at 7:30 a.m. picked up County Administrator Charles A. Crown at his Concord Twp. home. Road crews throughout the two-county area fought a losing battle. Gusting winds made plowing and salting of roads ineffective. Roads declared impassable by emergency crews at various times during the storm included Interstate 90 and Routes 20, 91, 2 and 84 between Painesville and Mentor. Mentor Avenue was restricted to one lane during the height of the storm before dawn. Lake County Road Department worker Sterling Sterl this morning said about 30 county workers were on double shifts manning the county's 20 snow plows most of the night. Several plows became stuck in the snow and slowed operations as they were freed by other vehicles, Sterl said. Eastlake officials said about a third of their residents were without electric power for several hours yesterday. The Cleveland Electric Illuminating Co. reported about 700 customers in Madison Twp. and Village were without power for about an hour starting at 8 p.m.
About 12 customers along Vrooman Road in Leroy Twp. also lost power last night. Several isolated customers lost power throughout the area as lines were broken by falling tree branches and high winds. CEI officials said the Eastlake blackout was caused by wind blowing wires bare and short-circuiting the system. Service was disrupted several times until the damaged wires were found at 8 p.m.
Scores of fender-benders were reported throughout the area as motorists struggled through icy streets and drifting snow. Police issued the standard "if possible, stay at home," advice today. The biggest accident occurred shortly after noon yesterday in Wickliffe, with a 13-car pileup forcing the closing of westbound I-90 in the city. No serious injuries were reported. Wickliffe Police Chief Andrew Zambory blamed the pileup on icy roads and wrote a letter to the Ohio Department of Transportation criticizing state snow removal and salting efforts on the highway. "It was unbelievable, just like an accordion," Zambory said. The westbound lanes were closed for more than three hours. A truck carrying flammable liquids jackknifed near the tieup, but did not spill. 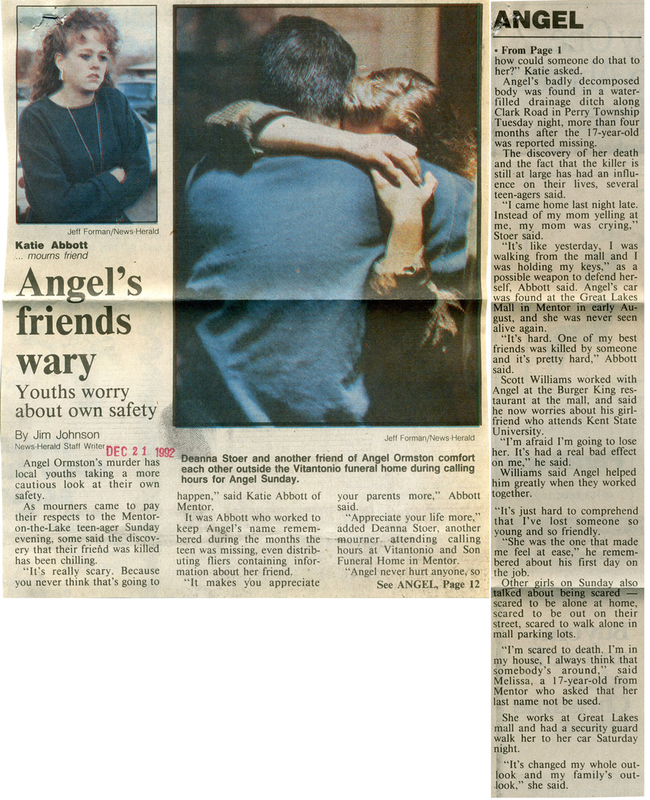 "It was the most cars we ever had pile up in an accident," said Zambory, a 25-year police veteran. "The cars were flying all over the place." Less than an hour after I-90 reopened in Wickliffe, another truck jackknifed in the westbound lanes near the Euclid Avenue exit. It took police another hour to clear the scene to reopen the highway a second time. Stranded cars blocked sidestreets and main arteries in several communities, stymying snow removal efforts. "The roads are hopelessly blocked with abandoned cars. Our plows and men cannot get through," Eastlake Mayor Morris Becker said. The mayor said towing firms reported they were between five and 12 hours behind and added city workers, in some instances, were pushing cars off the main arteries. "We're keeping our fingers crossed," said Willoughby Hills Fire Capt. William Moster. The department received only one call last night - a 4 a.m. request for help from a doctor who could not get his car out of his driveway. The doctor, who was needed for an emergency operation at West End Hospital in Willoughby, was quickly driven by firemen to the hospital. Heavy winds ripped electrical wires down in several cities. Willoughby firemen worked 40 minutes yesterday afternoon to remove a wire which fell atop a parked car on Erie Street. The hazardous road conditions failed to stop Eastlake firemen from quick response to two calls last night from persons complaining of chest pains. In both instances, firemen brought the victims back from complete arrest - no breathing, pulse or heartbeat. The victims, a 78-year-old man and an 84-year-old woman, were in West End Hospital today. The men who brought the pair back from the dead were Battalion Chief Fred Roberts, Lt. Jack Grove, Capt. Robert Bolin, and Firemen Wally Roberts, Terry Noland and Doug Cummings. A Lost Nation Airport official said today the Willoughby airport's runways are clear, but visibility is poor. "We will take an airplane if it is an emergency," the official said. A Hopkins International Airport control tower official in Cleveland told The News-Herald runways, taxiways and ramps are clear and in good shape. He said it reopened at 8 a.m. today. Visibility this morning also was a factor there. about 1,200 persons reportedly were stranded at that airport last night. The National Weather Service said conditions have not been bad enough at the airport for the storm to be classified as a blizzard. "Blizzard conditions call for visibility of less than a quarter mile, winds more than 35 miles and hour and temperatures lower than 10 degrees," said Carl Ewald, aviation meteorologist at the National Weather Service at Cleveland Hopkins Airport. "Here at the airport, the visibility has remained at about a half-mile although local conditions elsewhere have been worse," he said. He said last year's one-day January blizzard was worse, but of shorter duration. Winds up to 35 miles an hour are to continue today and will be accompanied by temperatures of no more than 10 degrees, he said. There will be an additional one to three inches with greater accumulation in southern Lake and Geauga counties. Severe drifting and blowing of snow is expected to continue. The bright bluish flashes of light many Lake County residents have reported seeing yesterday and today are lightening caused by extremely unstable conditions over Lake Erie. With the water temperature in the low 30s and much colder air passing over it, some thundershowers with snow have occurred over and near Lake Erie. Wind chill factor is expected to remain at about 40 below zero throughout the day. Follow our Historical Lake County Pinterest board for a look back at Lake County, Ohio. Those living in the Northeast U.S. are marking the anniversary of Hurricane Sandy, which made landfall one year ago today. On Oct. 30, 2012, the remnants of Sandy hit Northeast Ohio, damaging the area with high winds and heavy rain, and knocking out power for several residents. I remember being without power for a few days, but I had almost forgotten how much the storm affected daily life in the area. (Even trick-or-treating was delayed!) 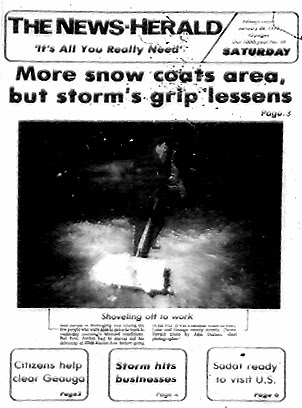 What are your memories of the storm? On Aug. 16, the "Old" Chardon Post Office Building will become the 14th site in Geauga County to receive the esteemed Ohio Historical Marker from Remarkable Ohio. 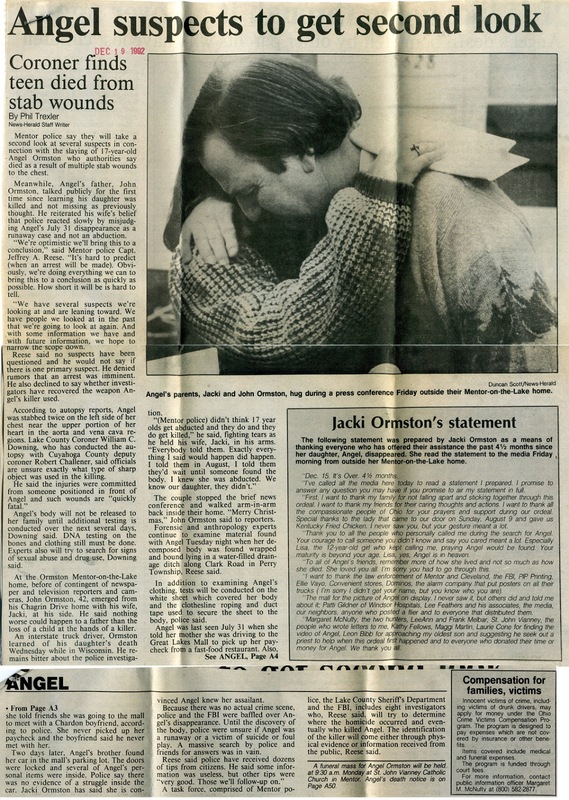 I found this photo in our archive, but the date was not attached to the image. My guess is early to mid 1980s. Anyone recognize the woman in the photo? Read more from Devon Turchan about the ceremony set for Friday evening at Chardon building to become 14th marked historical site in Geauga. 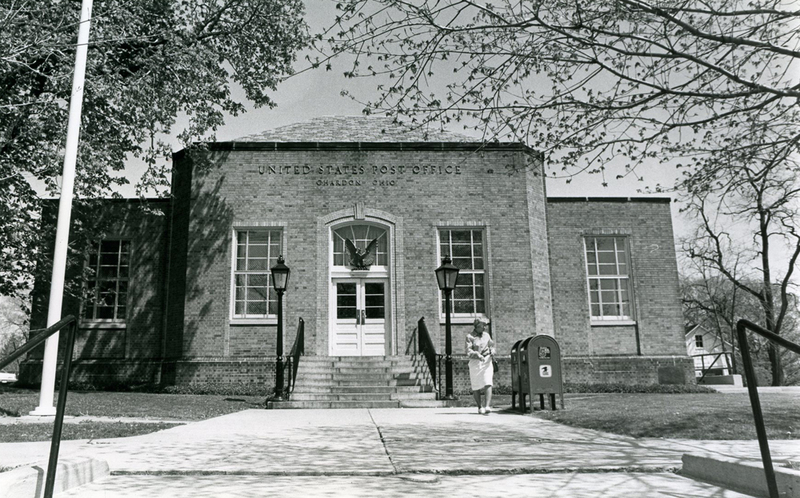 View the Old Chardon Post Office Building on Historypin. 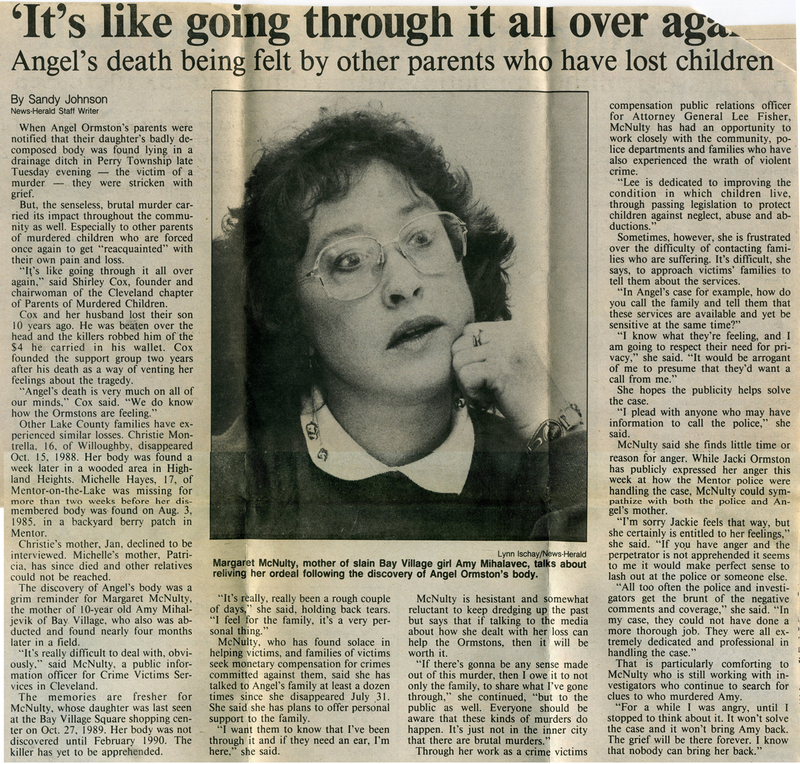 Mentor-on-the-Lake resident Angel Ormston was 17 when she went missing in the summer of 1992. Her body was found by hunters in Perry Township that December. 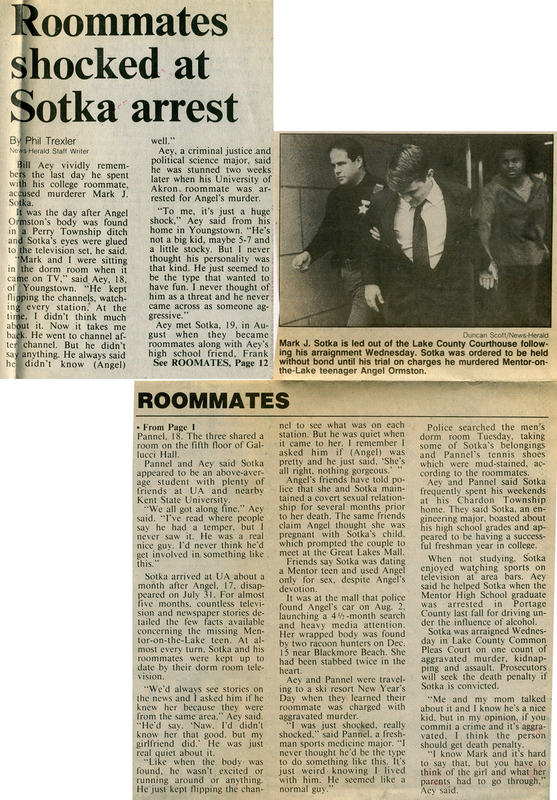 Mark J. Sotka, who was 19 at the time, was arrested and charged with her murder. 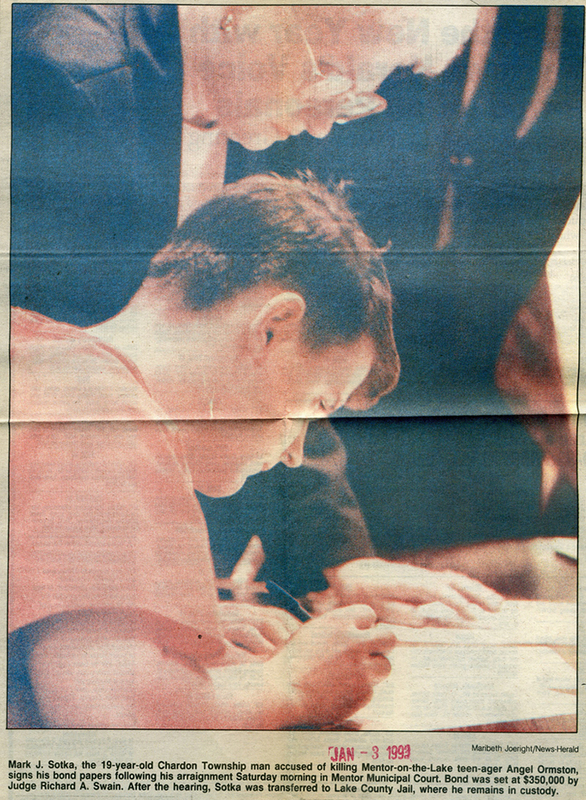 He pleaded guilty in February 1993 to aggravated murder and kidnapping, and was sentence to 30 years to life in prison. 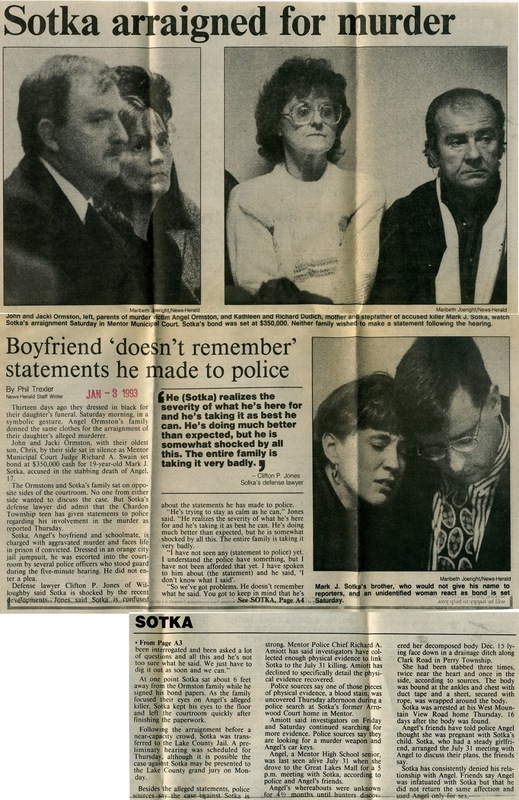 Sotka is up for parole in July. 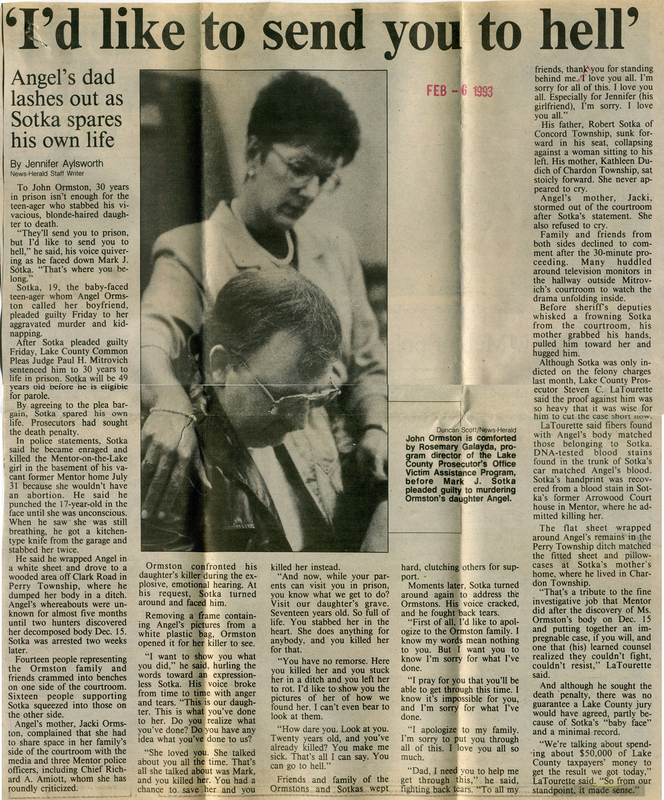 The family is asking concerned citizens to sign their petition at change.org and/or send a letter stating why Sotka should not be granted parole to justiceforangelormston@gmail.com by June 1 so they can submit it with the petition to the parole board. All letters and emails should include Sotka’s name and inmate number, A271852. 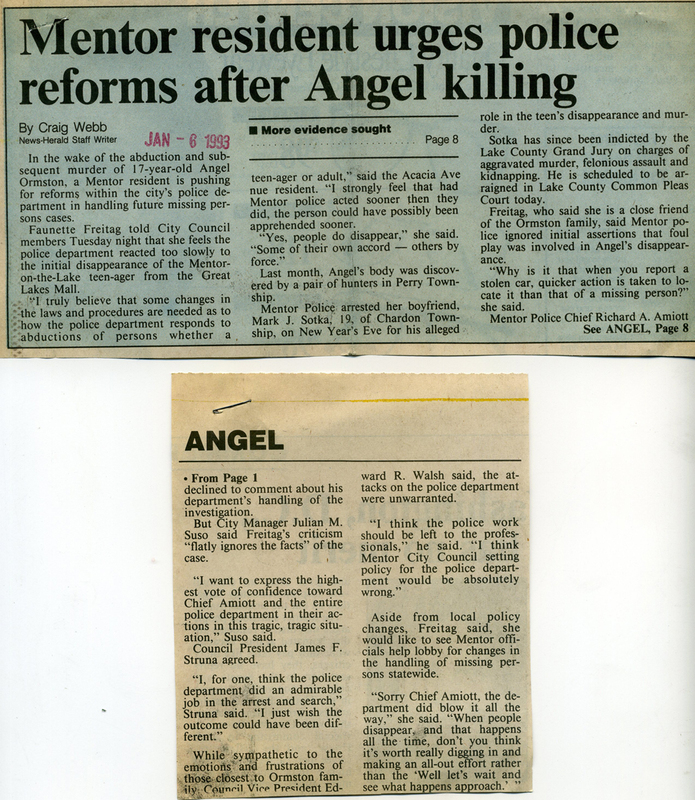 For more information, visit www.facebook.com/JusticeForAngelOrmston or twitter.com/justiceforangel. TJ wrestled at the Air Force Academy. He graduated from the Air Force Academy in 2001. He qualified for the 2001 NCAA Div. I National Wrestling Championships which were held in Iowa that year. He is the only Perry H.S. wrestler to qualify for the NCAA Div. I National Wrestling championships. He was also The Air Force Academy's 2001 Most Valuable Wrestler. 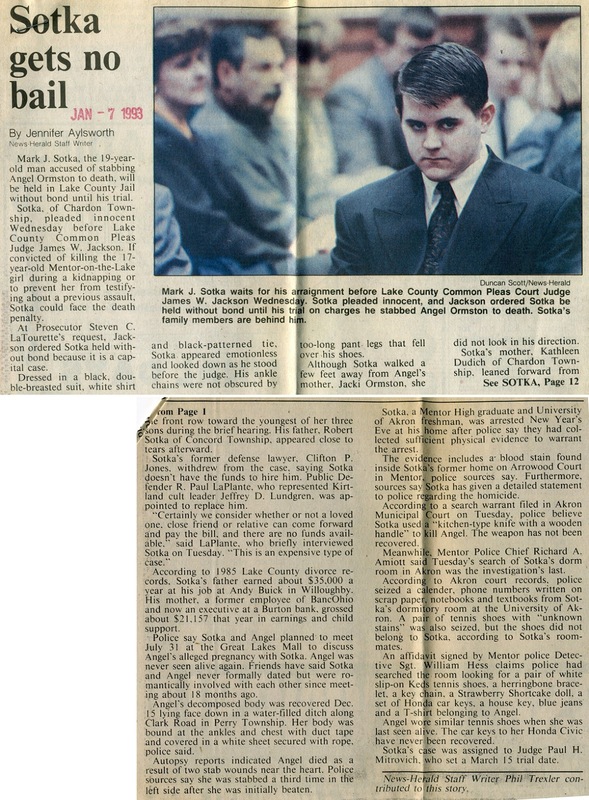 In high school, he placed 3rd in State as a sophomore (Div.III) and 4th (Div. II) as a junior. The brakeman report (1995-96) said his weight class (Div. II - 112 lb. weight class) was the toughest weight class of all three divisions because of all the returning state champs, state places, etc. When he was a freshman in h.s. he beat "the-to-be"
Div. I state champ at the Toledo Waite Tournament. The News-Herald pointed this out after the State meet. attend the Academy and wrestle! TJ's dad, Jack Huxel, started the Perry High School Wrestling Team in 1971. The team went undefeated in their 3rd season!!! TJ is a Major in the Air Force. He has flown C-5s and C-17s. Thank you for your service, T.J.! And thank you, Marsha, for all of the updated information on your son. 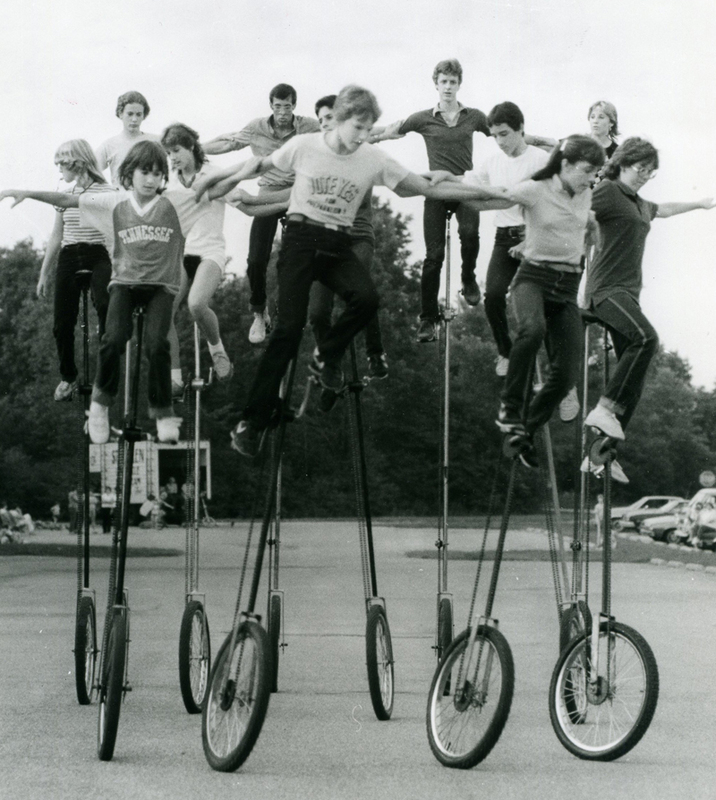 My first Throwback Thursday post featured a photo of St. Helen's unicycle team, and I asked readers to provide any information they could about the people in the photo or the unicycle team in general, as no photo caption was with the photo in our archive. I received an email from Nancy Winters, who was a member of the team from 1969 to 1974. 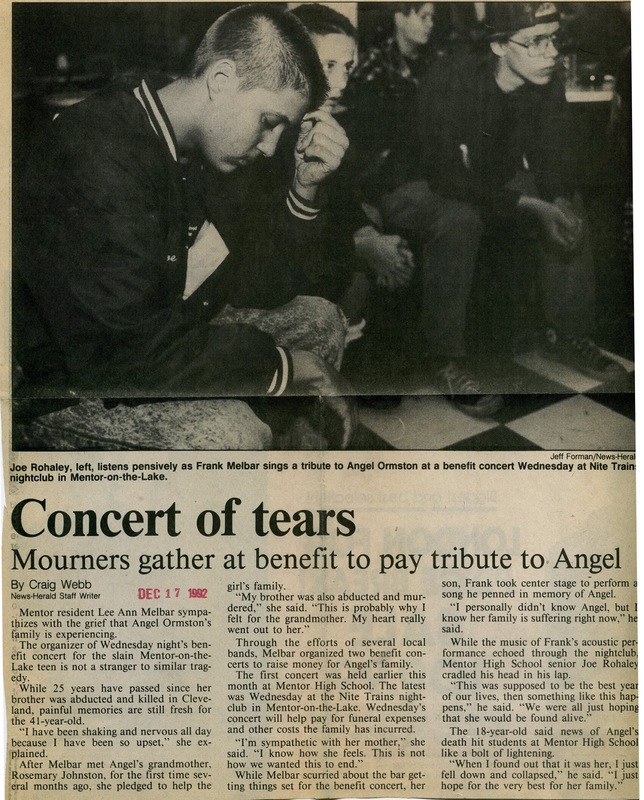 She said the original photo I published was likely taken in the late 1970s or early 1980s because "the boys are wearing their hair longer than Fr. Moran would allow and the girls shorts are shorter than he would permit as well." I am so impressed with how these kids got onto those unicycles and then were able to keep their balance! My lack of balance wouldn't have kept me on the unicycle team (or a unicycle in general) for very long. A reunion for members of the unicycle team and other St. Helen's grads is planned for May 18 at Berkshire Hills Country Club. Check out the Facebook event page St. Helen Reunion Grads and Unicyclists 1965-1985 for more information. The page includes some videos of the unicyclists, which are definitely worth checking out.